George D. Kymionis was born in 1969 in Piraeus Greece, he is married and is the father of one son (Dimitrios Kymionis, 4 years old). In 1991 he graduated from the University of Athens were he received the OD degree; he then continued his studies in the field of medicine and received his MD in 1996. He has worked as a research fellow in the University of Athens completing a series of research projects approved by the Greek ministry of Health; in 2000 he received his first PhD title in the field of general surgery. 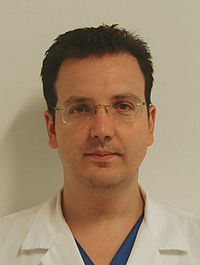 In 2000 he was accepted as a research and clinical fellow in the Institute of Vision and Optics (University of Crete, Dep. Of Medicine) up until 2003 were he concluded his second PhD degree in the field of Ophthalmology. From 2003 until 2007 he was a resident in Ophthalmology in the University hospital of Heraklion Crete Greece. In 2007 he was accepted for a one year period in Bascom Palmer eye institute as a research and clinical fellow in the department of cornea and refractive surgery. Today he holds an academic position in the Dep. Of Medicine, University of Crete (Lecturer in Ophthalmology). He has published a series of over 85 scientific papers and has over 650 citations; furthermore he has received a series of awards and scholarships throughout his academic career. He has participated in a large variety of congresses (national and international) presenting free papers, posters and videos, while he has contributed in writing chapters in over 10 books in the field of Ophthalmology. His main area of interest both in clinical practice and research activity is refractive and corneal surgery. Management of pellucid marginal corneal degeneration with simultaneous customized photorefractive keratectomy and collagen crosslinking. J Cataract Refract Surg. 2009 Jul; 35(7):1298-301. Effect of marking pens on femtosecond laser-assisted flap creation. Flap amputation with phototherapeutic keratectomy (PTK) and adjuvant mitomycin C for severe post-LASIK epithelial ingrowth. Eur J Ophthalmol. 2009 Mar-Apr;19(2):301-3. Thin LASIK flap creation using the SCHWIND Carriazo-Pendular microkeratome. J Refract Surg. 2009 Jan; 25(1):33-6. One-year follow-up of corneal confocal microscopy after corneal cross-linking in patients with post laser in situ keratosmileusis ectasia and keratoconus. Femtosecond-assisted anterior lamellar corneal staining-tattooing in a blind eye with leukocoria. Single intrastromal corneal ring segment implantation using the femtosecond laser after radial keratotomy in a keratoconic patient. J Cataract Refract Surg. 2009 Jan; 35(1):197-9. Second femtosecond laser pass for incomplete laser in situ keratomileusis flaps caused by suction loss. J Cataract Refract Surg. 2009 Jan; 35(1):153-7. Femtosecond-assisted astigmatic keratotomy for post-keratoplasty irregular astigmatism. J Cataract Refract Surg. 2009 Jan; 35(1):11-3. Comparison of Epi-LASIK and off-flap Epi-LASIK for the treatment of low and moderate myopia.